Deep within the layers of our skin are specialized cells called melanocytes. They are responsible for producing the skin pigment melanin. One fascinating fact about melanocytes is that, regardless of skin tone, we all have about the same number of these pigment-producing cells. So what makes some people fair-skinned and others have a beautiful dark complexion? It actually has to do with the size, rather than the number, of your skin’s melanocytes. The size, productivity, and distribution of melanocytes can have a major impact on appearance. Extended exposure to ultraviolet (UV) radiation – say, sunbathing at the beach – can cause melanocytes to grow in size and produce more melanin. This increased production of melanin makes the skin look tan. But melanocytes can also grow together in clumps under the skin. When this happens, a mole is born. Moles can develop on our skin at any time. Sometimes, babies are born with moles. Other moles can develop after exposure to UV radiation. Although the number of moles varies from person to person, fair-skinned people generally have more moles due to lower amounts of melanin in their skin. The average number of moles for adults is between 10 and 40. Moles can even come and go with hormonal changes such as pregnancy or puberty. The vast majority of moles are benign – meaning they are not cancerous and they do not pose a threat to our health. 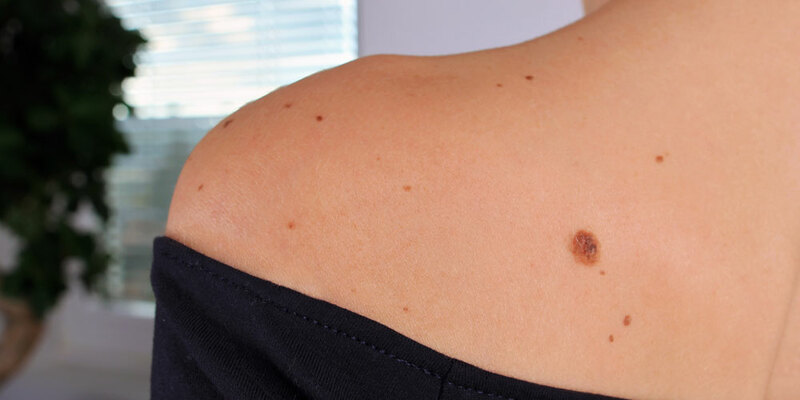 However, sometimes a mole is identified as being cancerous – or potentially cancerous – and must be removed. If you have been told that you have a mole that needs to be removed, you have two options. One is to allow your dermatologist to remove the mole in their office. This can be a good choice when the mole is very small or located on a discrete part of the body such as the back or legs. However, if the mole is larger than a few millimeters or is located on your face or other highly visible area of the body, having the mole removed by a plastic surgeon is the best option. Many patients have come to Beverly Hills Plastic Surgery Group to have their moles removed. We offer our patients in-office treatment options that safely and effectively remove the mole with minimal scarring. Call today to schedule your consultation and discover which treatment option is right for you.